Walls are commonly the most boring part of the home but there are a variety of things that you can them attractive ; like floating wall shelves , wall brackets and all sorts of things. Bracket wall shelves are quite practical if you have young kids and you want to safeguard your expensive decoration pieces in the house as the units placed over these brackets are high up the wall and out-of-reach of children. 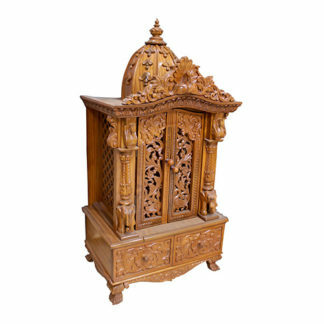 Bring home Aarsun Handmade bracket Shelf made in fine quality wood and carving.There is beautiful wooden carving done over at the back and below the shelf. You can place phones,small idols and other small decorative gifts over the bracket shelf. The design is really appealing. 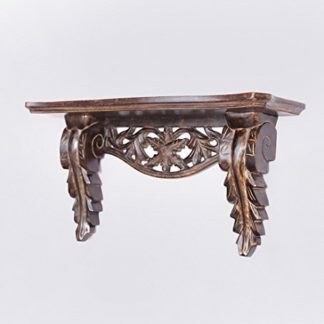 The support below the Bracket Shelf are carved-out in a single leaf pattern on both ends. In between the ends, the whole surface has been carved out in floral pattern. Wall Bracket is hand-buffed in antique style dark wood finish that can be seen on most of the vintage units. The overall look of the wall bracket is traditional and reflects the rich cultural heritage of India. The unit can be easily attached to the wall with the use of small nails to be placed inside the openings at the back. You may also get this Wall Bracket / Shelf in a variety of sizes. Even the shade and material used can be altered depending upon your home interior. The unit is in fine quality and finishing.There is hanging option at the back of the bracket shelf so that you can easily hang it at your wall. If you can see more designs and size you can see Wooden Wall shelf, and we also suggest to you have a look at Traditional Floating Shelves.